To save time, measure all dry ingredients into the same huge bowl & mix thoroughly by hand. 1. Melt peanut butter in lg saucepan over low heat, add chippits & vanilla, blend well until melted. Add marshmallows & toss in mixture to fully coat every marshmallow. Stir constantly over low heat until everything is melted and well blended. 3 Press mixture into a buttered 8x8 or 9x19 baking dish. Chill in refrigerator until hardened AND HIDE IT DAMMED GOOD LADIES! Burry it under the vegetables, men NEVER go there, they are after cheese summer sausage and lunch meats. Cut into squares before serving. 1. Make the sauce in a saucepan over low heat as follows: Melt butter, add sour cream, flour, spices & milk, bring to a boil for 1 minute, stir in 2 cups of the cheese. remove from heat. 2 In a large casserole dish, combine potato slices, bacon, onion & mushrooms. mix as evenly as possible without breaking the potatoes. 4 Bake in oven at 375 degrees F for about 45-60 min (depending on how old your oven is) or until all ingredients are cooked. remove cover and lightly brown top (do NOT stir). 5 Remove from heat, let sit 10-20 min to cool a bit. serve! In Large baking casseroles, divide The sauce ingredients evenly & blend well. Boil The Cabbage until leaves are soft enough to roll but NOT totally cooked. While cabbage is boiling, Mix all ingredients for "The Meat Mixture" above in a HUGE bowl BY HAND until everything is evenly blended. Peel off cabbage leaves, grab a large handful of meat mixture & put at the bottom of the leaf on the inside (where the large vein is;) Roll the meat up in the cabbage leaf tucking in both sides as you go. Place cabbage roll in one of the pots with the sauce, repeat until all meat mixture is gone. Divide Topping ingredients evenly between both casserole dishes & cover with tin foil. Bake in oven at 400 degrees for 1 hour or until done to your liking. 1 of Each of the following Sweet Peppers: Green, Red, Orange & Yellow. I will be adding to this shortly I have Tons Of Soup Recipes, Especially the Cream of whatever kind, If it can be cooked, I've creamed it lol (get your head out of the gutter) & frozen it for times I'm too tired or busy to cook;) I just dump it (frozen) in the crock pot, & go about my business so its ready by dinner time. Boil 4 Cups of Water & 1 Tbsp Milk in a Medium-large sized pot. Slowly add the following ingredients mix together well. Simmer until soup reaches the desired consistency. Leftovers are safe to freeze in plastic microwavable containers. Cap & shake well. Do NOT store in refridgerator. The Oil & Vinegar will separate. Keep in a cool dark cupboard or pantry. In a medium sized bowl, mix the following to suit your own taste: (I use Cups & Tbsp measurements for Large Dip dishes to feed at least 5--10people, and Tbsp & Pinches for 2-4 people). 3 Parts of Miracle Whip (Parts can either mean Cups (for 5+ people) or Tbsp(for 2-3 people) depending on how many people you are feeding). Mix well and Keep refridgerated. If you plan to make the dip for personal use, it Keeps for about (1-2 weeks if you use a plastic container or a glass jar with a tight lid. Do not put it back in the fridge after it has warmed to room temperature. 1. Start with salsa & ketchup. 3. Mix well and refrigerate. 4. Store in glass jars with screw on lids. 5. Use as dip for all kinds of seafood. 1/2 English (seedless) cucumber, not peeled, seeded and finely chopped plus a few thin slices. Meanwhile, in colander set over bowl, toss chopped cucumber with 1 teaspoon salt. Let drain at least 1 hour at room temperature, or cover and refrigerate up to 8 hours. In batches, wrap chopped cucumber in kitchen towel and squeeze to remove as much liquid as possible. Pat dry with paper towels, then add to bowl with yogurt. With flat side of chef's knife, mash garlic to a paste with remaining 1/2 teaspoon salt. Add garlic, chopped mint, oil, vinegar, and pepper to yogurt and stir to combine. Cover and refrigerate at least 2-4 hours. Serve chilled, topped with cucumber slices and fresh dill & mint sprigs. Per tablespoon: about 17 calories, 1 gram protein, 1 gram carbohydrate, 1 gram total fat (0 gram saturated), 1 mg cholesterol, 182 mg sodium. Cool eggs before peeling by letting them sit in cold water for about 3-5 minutes. Peel eggs, Cut in half (the same as devilled eggs), scoop out yolks and place them in a separate bowl. place egwhites on a serving platter or plate. Mix Egg yolks with Miracle Whip To suit your own Taste (About 3 Tbsp). Season with 10 small pinches of my egg spice, 1 pinch for each egg. Scoop mixture into egg whites (same as devilled eggs). Add a sprinkle of Spanish (Hot) Paprika with a sprig of fresh Parsley and/or Parmesan cheese on top is optional. Miracle Whip To Taste (About 5-7 Tbsp). Peel & mash boiled eggs with the miracle whip. Season with my egg spice to taste. A sprinkle of Spanish (Hot) Paprika is optional. Use 1 Pinch of mixture for each egg. Makes 1 microwaved egg at a time. Sprinkle a tiny bit of salt into the bottom of the microwave egg container. (Salt attracts microwaves & makes the egg cook faster). Crack egg & pour into the microwaved egg container & make sure you break the yolk with a fork. Add 1 Pinch of egg spice. Grate old cheddar cheese on top and Add a tiny bit of Salt & Pepper. Mix well to blend all the ingredients. Put the lid on the microwave egg container, & place in microwave. Cook on high for 45 seconds. a freeware version of EGS' recipe management programs. This software serves as a tool for you to store your recipe collections, whether it came from your own formulation, friends, colleagues or from any of our sites: www.recipecenter.com, www.recipegallery.com, www.centrerecettes.com (in French), www.recettes.ch (in French), www.rezeptzentrum.com (in German), and www.rezeptbuch.ch (in German). 17 recipes featuring...raisins :P You can either download the PDF version or fill out their online form for a hard copy of the recipe book to be mailed to you. Canadian beef is a source of 14 essential nutrients, including protein and iron. Want to know more? Learn all about the nutrients found in delicious Canadian beef, how to “Eat Out, Eat Healthy…It ’s Easy! ”, and much more in our Nutrition and Health resources. Make It Beef Spring 2009 NEW! Select Medium crust. Do not select the timer, just push start because this is a variety bread. When bread is cooked (and cooled), remove from machine & cut into slices. I made it for my husband & father in law as a nice breakfast treat. GMA Recipe: Do-it-Yourself Fudge Pops! Summertime is fast-approaching and, in no time, you’ll be wishing you had something cool and tasty to grab from your freezer! While I love the stuff you get from grocery and corner stores, it’s also nice to be able to make something delicious if you don’t feel like going out or even if you want to have more control over the flavor and fat content of your treats! Good Morning America featured a couple recipes for do-it-yourself frozen fudge pops and the great thing is that, for lighter versions, fat-free half-and-half can be substituted in either recipe! Also, as I mentioned above, it’s nice to be able to control the taste of your own snacks so, again, substitutions can be made in these recipes: the cherry jam in the Chocolate Cherry Fudge Pops can be replaced with any jam. Raspberry, apricot and strawberry are nice. And peanut butter is excellent in the Chocolate Marshmallow Pops. Serving numbers will vary depending on the size of your frozen pop molds. In a medium saucepan over low heat, combine the half-and-half and chocolate chips. Heat, stirring constantly, until the chips are melted. Transfer the mixture to a blender, being sure to scrape the chocolate from the bottom of the pan. Add the jam, vanilla and salt, then puree for 30 seconds, or until smooth. Divide the mixture between about 8 frozen pop molds (number will vary by size), then insert sticks according to product directions. Freeze for at least several hours. In a medium saucepan over low heat, combine the cream, half-and-half, chocolate chips and marshmallows. Heat, stirring constantly, until the chips and marshmallows are melted. Transfer the mixture to a blender, being sure to scrape the chocolate from the bottom of the pan. Add the vanilla and salt, then puree for 30 seconds, or until smooth. Divide the mixture between about 8 frozen pop molds (number will vary by size), then insert sticks according to product directions. Freeze for at least several hours. Please note - you will need a good thermometer. The temperatures are very important! 1. Coffee Fudge w CaraibePut all of the ingredients in a good, thick-bottomed pan (it shouldn’t be too small, or it’s more likely it will burn). 2. Melt over low heat, stirring until chocolate and sugar are dissolved. 3. Cease stirring, increase the heat, and bring the temperature to 115C. 4. Immediately place the pan in a cold water bath to stop the cooking process (you can use your sink, half-filled with water). 5. Cool until 80C. Beat with wooden spoon until fudge lightens in colour and becomes more solid. 6. Pour into baking tray and cool until the fudge sets. 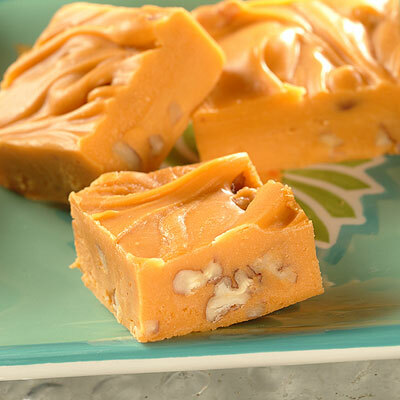 This peanut butter fudge is not only simple to make but it is tasty too. Lightly grease an 8 x 8 foil-lined pan. Melt butter and peanut butter in top of double boiler. Stir until melted. Stir in powdered sugar. Stir until smooth. Quickly pour in prepared pan. Once cool, remove foil and fudge. Dump-out on cutting board and cut. This yummy fudge is a fail-safe recipe perfected by CARNATION - they taste as good as they look! # 1 Grease and base line a 20cm (8in) square tin with baking parchment. # 2 Heat the milk, sugar and butter in a large, non-stick saucepan over a low heat, stirring until the sugar dissolves completely. Bring to the boil and simmer over a low heat for 10-15 minutes, stirring continuously and scraping the base of the pan. 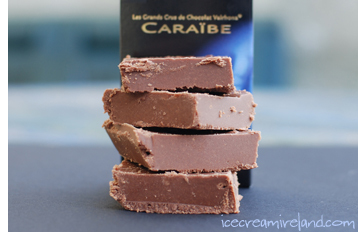 Test the fudge at intervals by dropping a little of the mixture into ice-cold water. Press the blob between your fingers (carefully as it will be very hot!). If a soft ball forms then it's ready to beat. # 3 Remove from the heat, cool slightly and beat the fudge until thick and grainy. This usually takes about 10 minutes - see if you can find a couple of eager helpers. # 4 Gently stir in the remaining ingredients. Pour into the prepared tin and leave to cool before cutting into squares. TIPS: Once you've mastered the original recipe, try these versions - or get creative and invent your own! * Chocolate - melt 150g (5 ¼ oz) plain chocolate and stir through before beating the fudge. 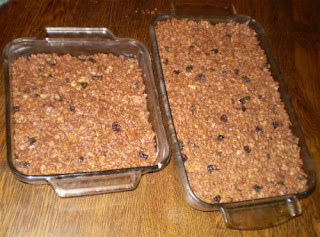 * Rum and raisin - stir through a good dash of rum and 115g (4oz) chopped raisins. * Toasted pecan and cinnamon - toast a large handful of chopped pecan nuts in a dry pan with a sprinkling of cinnamon until the nuts start to smell aromatic. Set aside to cool slightly then stir through the fudge mixture at the end of beating. * Confectionery fudge - chop up your favourite chocolate such as KitKat or Munchies and stir through cooled beaten fudge. 1. In a medium-sized saucepan, combine the milk, sugar, butter and salt. 2. Bring to a boil and cook for about 5 minutes, stirring constantly. 3. Add in the chocolate chips and cook until melted. 4. Remove from the heat. Stir in the marshmallows, nuts and vanilla extract, mixing well. 5. Pour into a 8-inch pan. Let cool, then cut into squares. Let cool to 115 degrees F; add nuts and vanilla extract. With an electric mixer at medium speed, beat until mixture loses its gloss and starts to harden around edge of saucepan. Pour into prepared baking dish. Cool completely. Cut into squares. Yields 24 servings (2 pieces per serving). Recipe and photograph provided courtesy of Nestle and meals.com - used with permission. (start once the boil resumes). Use the lowest flame possible to keep the rolling boil. temperature. Remove from pan, remove foil, cut into squares. butter (Skippy or Jif and reduce the butter to 1/8 cup (1/4 stick). MORE: (From my message board-Helen-PA): I use the Nestles caramel loaf, then dip in mini marshmallows or others & finish w/honey crushed nut topping, or english toffee, mini choc. milk, dark or white wafers, etc. I charge $12.00 for each apple right now. Prepare a single batch of Lunatic Fudge (using Semi-Sweet Chocolate or Milk Chocolate Chips). Don't cast the fudge into a pan but instead keep the mixture warm (Low or Med-Low heat) then dip the chilled apples into the chocolate fudge and let cool on waxed paper. 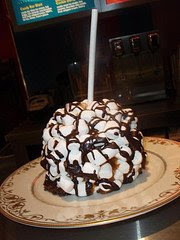 Alternatively, you can use a wooden spoon to "dribble" the hot chocolate fudge over the apples for a dramatic effect. You can make more Royal Apples since you will only need to coat the apples once in the caramel mix, then roll into the nuts. Massively good. Pour any remaining Lunatic Fudge into a small pan or cup-cake tins. LUNATIC FUDGE - Quick and easy way to make Dark, Medium, and Light Chocolate Fudge, Vanilla Fudge, Peanut Butter Fudge, Butterscotch Fudge, or just about any other flavor of which you can think. To caramel - add butter - then add can milk... put in microwave for several minutes - be careful not to scorch... I pull mine out and stir it every so often. The nice thing about this is that you can use it and then keep the leftovers in the frig and just reheat in microwave - it still is as fresh as when you made it. The butter helps with this. ENJOY - I usually slice my apple - however, we have been known to drizzle this over popcorn - and have cream cheese on the side to serve with it. It is delicious but VERY RICH!!!! Pour sugar into large skillet. Heat over medium-low heat until sugar begins to melt. Continue to heat and simmer until syrup turns pale amber color. Swirl in butter and vanilla extract. Add to caramel syrup, stirring to coat. Stir syrup to dissolve any clumps of sugar. Cover skillet and cook over low heat until apples exude juices, about 5 minutes. Uncover and continue cooking until syrup is thick, basting apples occasionally. To serve, spoon caramel apples into dessert dish and top with scoop of vanilla ice cream. Insert sticks into bottom of apples. In 1 quart glass measure, warm/melt caramels with 2 tbsp water on high 3 to 4 minutes until melted, stirring halfway through. Dip apples in caramel, using spoon to coat completely. Place on waxed paper lined plate. Make faces with candy or sprinkles. Freeze 15 minutes. Serve immediately or refrigerate. Makes 4 servings. Caramel apple dipped in white chocolate and peanut butter. Insert craft sticks into apples. Cover each apple with 1 caramel wrap. Microwave at HIGH 15 to 20 seconds. Cool. Melt chocolate bar in a small saucepan over low heat. Dip each apple into chocolate; let dry. Melt vanilla bark coating in a small saucepan over low heat; stir in orange food coloring. Dip or drizzle each apple with vanilla coating mixture. Decorate with desired toppings, and let dry. NOTE: For testing purposes only, we used a Ghirardelli chocolate bar. 2. Place the butter and marshmallows in a medium sized microwave-safe bowl, place in the microwave and heat on HIGH for 15 about seconds. Stir, then heat for another 10 seconds and stir again (the marshmallows should be smooth and pourable). 3. While the marshmallows are still very hot, dip each apple one at a time into the marshmallow. 4. Lightly roll each apple in crispy rice, and set on a wax paper-covered cookie sheet 1-2″ apart. 5. Reheat any leftover marshmallows. 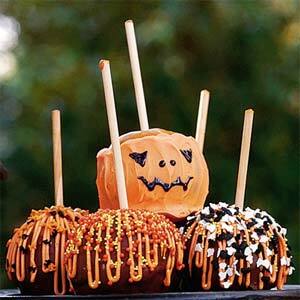 Using a spoon, drizzle the remaining marshmallows over the apples, giving them a “spiderweb” look. 6. While still hot, put sprinkles on the coating, if desired. Instead of caramel, dip your apples into a rich toffee mixture of dark brown sugar, molasses and butter. You'll need a candy thermometer, wooden sticks, and a heavy sacuepan for these treats. Wash and dry apples; remove stems. Insert wooden sticks into the stem end of each apple; set aside. Combine sugar and remaining ingredients in a medium saucepan. Bring to a boil over medium heat; cover and cook 3 minutes. Uncover and continue cooking, without stirring, until mixture reaches 280° (about 8 minutes). Remove from heat. Quickly dip apples in sugar mixture; allow excess to drip off. Place apples, stick sides up, on prepared pan; cool completely. "Apples and peanut butter are a classic combination. 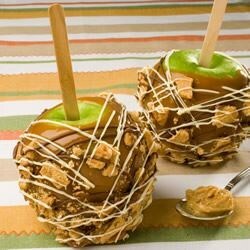 Surprise your friends this fall with this crispy peanut butter cookie coated caramel apple creation." 3. Spread the chopped cookies out on a dinner plate. 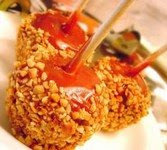 Roll caramel apples in the cookies and place on the aluminum foil. Place the milk chocolate and white chocolate into separate microwave-safe bowls. Heat in the microwave at 30 second intervals, stirring between each, until melted and smooth. Drizzle milk chocolate over the apples, then drizzle the white chocolate over the milk chocolate. Refrigerate until ready to serve. 1.Line 13X9-inch baking pan with waxed paper; set aside. To prepare apples, wash and dry completely. Remove stems. Insert craft sticks into centers of apples. 2. Combine caramels and water in small saucepan. Simmer over low heat until caramels melt and mixture is smooth, stirring frequently. 3. Immediately dip apples, one at a time, into caramel to cover completely. Scrape excess caramel from bottom of apple onto side of saucepan, letting excess drip back into saucepan. 4. Immediately roll apples in nuts to lightly coat, pressing nuts lightly with fingers so they stick to caramel. Place apples, stick-side up, on prepared baking sheet. Let stand 20 minutes or until caramel is set. 5. Place chocolate in small resealable food storage bag; seal bag. Microwave on MEDIUM (50%) 1 minute. Turn bag over; microwave on MEDIUM 1 minute or until melted. Knead bag until chocolate is smooth. 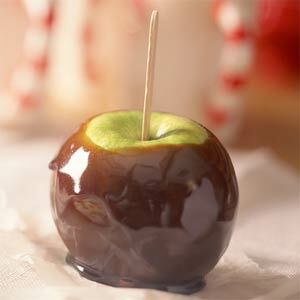 Cut off very tiny corner of bag; pipe or drizzle chocolate decoratively onto apples. 6. Let apples stand 30 minutes or until chocolate is set. Store loosely covered in refrigerator up to 3 days. Let stand at room temperature 15 minutes before serving. Cellophane bags...I cannot tell you any size. Measure the apple and order accordingly. Have apple at room temperature, washed and dried. Make a "bed" of pecan pieces on a flat jelly roll pan. Melt caramel in a bowl. Roll the apple in the caramel. Dip in Merckens coating chocolate. Let chocolate set to harden at room temperature. Place in cellophane bag. Tie with pretty bow. CANDY APPLES dipped in white chocolate, drizzled with milk chocolate. Line 2 large baking sheets with waxed paper or heavily buttered foil. Remove stems from apples. Insert 1 chopstick or skewer into stem end. Stir 2 cups sugar, 1 cup brown sugar, 1 cup water and 1 1/2 teaspoons cloves in heavy medium saucepan over low heat till sugar dissolves. Increase heat and boil without stirring until candy thermometer registers 285F (soft-crack stage), about 20 minutes. Remove pan from heat. Immediately dip 1 apple into caramel, coating completely and allowing excess to drip back into pan. Stand apple on prepared sheet. Repeat with 9 more apples. Make caramel again in clean saucepan with remaining ingredients. Dip remaining apples. Note 1: This makes a crunchy caramel coating. Note 2: Pans can be cleaned easily by soaking in water. 1. coat the apples with WHITE coating chocolate. Groom: once coated white, coat again in milk choc. Add dots of choc. for buttons and a cloth tie (we don't have ties). 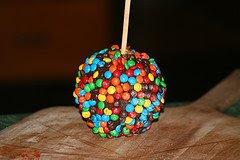 Prepare as Caramel Apple above, but drizzle coating chocolate over the apple after the caramel dries. Heat Caramel to approx. 180F. Add White Chocolate and stir gently until melted/blended. Dip apples, be sure apples are washed, fully dried and free of any wax. Bring sugars, milk and butter to a boil. Stir until caramel is melted. Dip apple slices in warm mixture. Blend together the first 4 items until smooth. Serve with sliced apples to dip or put sliced apples in dish, top with caramel topping and sprinkle with peanuts. Melt together sweetened condensed milk, stick of butter and Peter's Caramel. Warm until well mixed, and dip your favorite apples, or any other fruit or cake or nuts and enjoy. Remove stems and insert lollipop sticks. Line a cookie sheet with foil and lightly butter the foil. Combine sugar, corn syrup and water in a 2 quart heavy saucepan. Put over high heat and stir constantly with a wooden spoon until all sugar crystals are dissolved. Wash down sides of pan with pastry brush dipped in hot water. Clip a thermometer on pan. Cook without stirring to 285 degrees. Remove from heat and quickly stir in flavoring and color. Tilt pan and quickly dip apples. When apple is covered, twirl to coat evenly. Set on foil of prepared pan. Serve apples within several hours or wrap very well in plastic wrap. If not wrapped, the apples will become sticky from the moisture in the air. Any left over syrup can be poured onto the buttered foil. When hard, break into small pieces of candy. 1. Slice apple crosswise into 1/4-inch-thick slices; remove seeds. Place stack of apple slices in small microwavable bowl; sprinkle with gelatin. Pour cola over slices. 2. Cover loosely with waxed paper. Microwave on HIGH 2 minutes or until liquid is boiling. Allow to stand, covered, 5 minutes. Arrange rings on dessert plate. Serve warm with whipped topping. Note: This recipe can be doubled or tripled easily. To cook 2 apples at a time, increase cooking time to 3-1/2 minutes. To cook 3 apples at a time, increase cooking time to 5 minutes.Tip: This recipe works great with any crisp apple. A Jonathan apple will give a tart flavor, a Cortland apple will give a sweet-tart flavor and a Red Delicious apple will give a sweet flavor. Choose your favorite apple and enjoy! Whether you call them taffy apples or toffee apples, or know them as caramel apples or just plain candy apples, there's no doubt that these tasty treats are a perennial fall favourite. Perfect to serve your guests on Halloween! Remove any stems or leaves and insert a wooden stick into the end of each apple. Heat and stir sugar, corn syrup and water in a saucepan until sugar has dissolved. Boil until the syrup reaches 300 degrees on a candy thermometer, or until a little syrup dropped into cold water separates into breakable threads. Remove from heat and stir in cinnamon and food coloring, if using. Dip one apple completely in the syrup and swirl it around a little with the stick to coat. Hold the apple above the saucepan to drain off excess. Place apple, with the stick facing up, on a well greased pan. Repeat with remaining apples. If syrup thickens or cools too much, simply reheat briefly before proceeding. Variations: After coating each apple, quickly dip the end or press and swirl apples in shredded coconut, colored M&M's, chopped nuts, granola or colored sprinkles. Wash and dry the apples, removing any stems. Insert a wooden stick into the end of each apple. Combine butter, brown sugar, corn syrup and milk in a heavy saucepan. Boil for 30 to 40 minutes, or until syrup reaches 248 degrees (firm ball stage) on a candy thermometer. Dip each apple into the caramel mixture, swirling to coat. Set apples on wax paper to cool completely before serving. Wash and dry apples and remove stems. Insert a wooden stick into the end of each apple and set aside. Place unwrapped caramels and milk in a microwave safe bowl. Microwave on high for 2 minutes, stirring once. Swirl each apple in caramel mixture, then place on a well greased cookie sheet to cool and set.